Reston Ride on Thurs. Sept. 27 - Ride with FABB to check out new bike lanes striped in Reston this summer. We will ride at a slow pace and stop occasionally to discuss the development of bike facilities in the Reston area. We'll also discuss some Reston points of interest. After the ride you're welcome to sample some of the new beverages being brewed at The Bike Lane. The Bike Lane will contribute to FABB for each beer sold that night. Ride starts at 5pm. The route is approximately 12 miles (shortened due to sunset at 7pm) and the ride will take about 1.5 hours. 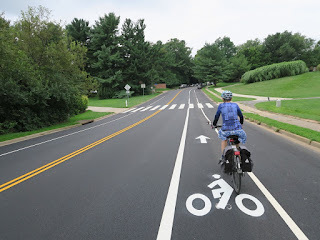 Meet at The Bike Lane, 11150 Sunset Hills Road, Reston. Helmets are required and riders will be asked to sign a liability waiver before the ride. Register on Eventbrite. See a map of the proposed route. Tour de Mt Vernon on Sat. 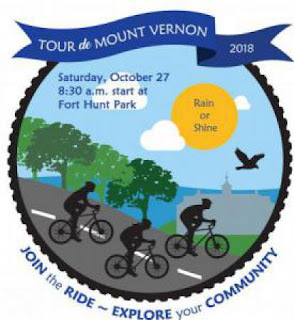 Oct. 27 - FABB is a co-sponsor of this years Tour de Mt Vernon. Beginning and ending at Fort Hunt Park, we will take a scenic tour of the Mount Vernon District. Riders will have the option of riding the full 35 mile route, or just joining us for the first 15 miles for a shorter route. The ride will begin at 8:30am and will conclude with food, beverages, music and prizes!